Camps filling quickly. Sign your little one up today. 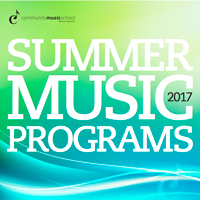 Community Music School of Webster University (CMS) summer camps are filling up quickly and the application deadline is May 15. These high-quality, educational and fun music summer camps are available to children and students ages six months through high school and take place in the Community Music School Center (CMS Center) on the campus of Webster University. There will be an additional session of Kindermusik Summer Adventures - On the Road! at our lovely Chesterfield location in Faust Park at the Leon Strauss Center. Kindermusik® Summer Adventures - On the Road! For more information, please visit the Community Music School page. Founded in 1925, the CMS offers outstanding music education and performance opportunities to students of all ages and abilities and serves the entire St. Louis metropolitan region. Classes are available in University City, at Faust Park in West County, and at CMS headquarters located on the Webster University campus in Webster Groves. For more information, call 314-968-5939 or visit webster.edu/cms. The Community Music School of Webster University is accredited by the National Association of Schools of Music and is a certified member of the National Guild of Community Schools of the Arts. The Community Music School receives assistance from the Arts and Education Council of Greater St. Louis. Financial assistance for the Preparatory Program has been provided by the National Endowment for the Arts.